HTML stands for HyperText Markup Language. HyperText is the method you use to move around on the web — by clicking on special text called hyperlinks. These hyperlinks bring you to the next page. You can go to any place on the Internet whenever you want by clicking on links. There is no set order to do things. Markup is what HTML tags do to the text inside them. They mark text as a certain type (italicized or bold, for example). 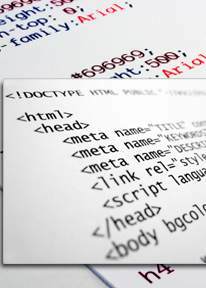 HTML is a language, as it has code-words and syntax like any other language. These tutorials are not intended to overwhelm you. They are setup to allow for daily familiarization with the concepts and facilities of HTML. Take a week, take a couple of days, whatever pace of learning makes you comfortable. We'll still be here when you get back. HTML Tutorial 2 - HTML Tags. The basic construct of the language, tags represent beginning and ending points for the document, it's body, text, images, and links. You will see a lot of this character: < and this one: > as well as this one: /. HTML Tutorial 3 - Manipulating Text. Here you'll learn how to control the size and font face for your text, select the color, and create headings, italics, or bold type. We'll also introduce you to alignment... setting the margins on the page and justifying the text left or right. HTML Tutorial 4 - Hyperlinks. This is the navigation system of HTML. Learn how to link your pages to any others on the World Wide Web, including this one. Getting connected and linking networks together is what the Internet is all about. Through the use of hyperlinks you connect the dots of your site, enabling your visitors to find their way from one section to the next, and link it with the rest of the internet community. It's the greatest of cyber friendships. HTML Tutorial 5 - Graphic Images. Learn how to place images on your pages like photographs or graphic art, how to integrate them with the text to add to the aesthetic appeal of your design, and how to use these images as hyperlinks. There are also a number of different image formats you must become familiar with. HTML Tutorial 6 - Manipulating Images. You can size images on a page, put borders or frames around them, or provide alternate descriptive tags for informational purposes. You can align images to the left, right, top or bottom of the page. HTML Tutorial 7 - Summary. While it's best to learn how to hand-code HTML, there are many software products out there that will do it for you. From WYSIWYG to text editing, find the one that's best for you. Then, move on to our advanced topics. Seven day HTML tutorials from Joe Burns web site and book titled HTML Goodies. We liked his lesson a day concept. Extremely content rich, HTML Goodies can be purchased at Amazon.com.